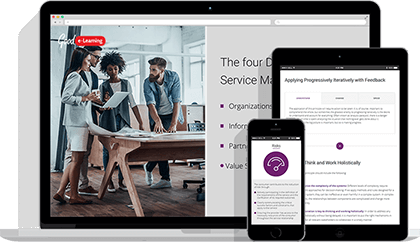 What do you need to know about ITIL 4? Who can benefit from the ITSM framework? How do you go from ITIL Foundation to ITIL Expert? Are you already certified in ITIL V3 and want to update your qualifications? We’re here to answer all your questions! Over the past several decades, IT has grown to play a fundamental role in the world of business. IT-enabled products and services now seem to permeate everything we do, and the rapid evolution of technology in the workplace has provided adaptive organizations with ample opportunities to improve their offerings and day-to-day operations. Indeed, IT service management (ITSM) now has a role in everything from customer service to marketing and sales. Maximizing the value and efficiency of IT services has naturally become a crucial priority, but it is no longer sufficient to simply hire anyone with a background in tech. A competent IT manager must also be able to ensure alignment between business and IT, support major corporate goals and constantly be on the lookout for new ideas, practices and technology to bring on board. ITIL, formerly known as the ‘Information Technology Infrastructure Library’, is one of the world’s most widely used frameworks for ITSM. It offers a series of best-practices which can apply to any organization that utilizes IT services, whether for delivering value to customers or enabling internal operations. Indeed, to this day ITIL has been applied to every industry from space exploration to animation, all with a shared language and methodology that makes it easy for practitioners of various backgrounds to collaborate. 2017 saw the announcement of 'ITIL 4', the latest iteration of the framework. Naturally, this raised a lot of questions among potential, current and past students. They wanted to know what the new framework would have to offer, as well as what it would mean for those with existing certifications. With that in mind, let’s take a look at some of the most common questions surrounding ITIL 4. Will ITIL V3 certifications still be valid? If you studied V3 to gain an ITIL certification, you do not need to worry about it going out of date. Those currently studying V3 can also continue to do so and the best-practices covered in the earlier framework are still highly valid and applicable. That said, it will still be a good idea for certified practitioners to consider transitioning to ITIL 4 at some point in the future in order to take full advantage of the updates to the framework. AXELOS also has plans to discontinue ITIL V3 books in June 2020. How can I transition from ITIL V3 to ITIL 4? ITIL Foundation - Even if you have achieved your ITIL V3 Foundation certification, your best course will still be to restart with ITIL 4. The reason is that there is so much new examinable material that a full exam is required to demonstrate your knowledge. ITIL Intermediate and beyond - If you have passed ITIL Foundation and started collecting credits from either the Lifecycle Stream or Capability Stream, you may want to continue until you have passed Managing Across the Lifecycle (MALC). Again, these modules are all still highly useful and relevant. Once you pass your MALC exam, you will be able to take the MP Transition module. Can only large organizations benefit from using ITIL? ITIL can help any organization regardless of its size, sector, industry or location. Indeed, with most businesses now relying on IT in some form or another, it would be more difficult to find one which couldn’t benefit from using the framework! Can ITIL 4 incorporate other frameworks? A lack of compatibility with other ITSM standards and frameworks was one of the biggest problems that practitioners had with ITIL V3. AXELOS responded to this by specifying early on that ITIL 4 would be fully compatible with a number of popular frameworks, including Agile, DevOps and Lean. This should make it easy for an organization which already uses a specific framework to incorporate ITIL. Indeed, users are encouraged to treat ITIL as a solid foundation for ITSM; one which can enhance the benefits of other frameworks and enable them to create even greater value for users. Are ITIL certifications only useful for managers? There are multiple roles to play in ITSM. While the framework is well-suited to those managing IT departments, it can also be useful for those involved in service development, customer support and so on. These lower-level users can also treat studying ITIL as a stepping stone to help them advance their careers. Many organizations even choose to upskill entire teams or departments in ITIL’s terms and methodology. Having everyone familiar with the framework can enable a startling boost in productivity, collaboration and communication, with all practitioners making valuable contributions to empowering digital transformation and continual service improvement. It is also worth mentioning that purchasing ITIL training in bulk can allow an organization to take advantage of generous discounts! Good e-Learning supply large-scale corporate ITIL training to a number of global organizations including IKEA, MHP, and Capita. Visit our corporate training page to find out more! Wouldn’t a single framework be too rigid for modern ITSM? It is true that, while IT is now utilized by virtually every organization on the planet, the needs and capabilities of any two organizations will rarely be identical. In other words, there would be little value in employing a ‘one size fits all’ approach. ITIL may be a single framework, but it has the advantage of being non-prescriptive. It is not a strict set of rules to follow, but rather a highly adaptive and agile framework which can be applied almost anywhere to various degrees. It is designed to support organizations in what they do, providing tools and guidance to help them maximize the value of their work, and users can even pick and choose which parts of the framework they want to apply. Another important thing to keep in mind is that the ITIL practitioner community has been heavily involved in the development of ITIL 4. Members will continue to provide ongoing advice via the AXELOS forums, ensuring that anybody who wants to apply the framework will have all the guidance required to do so. Is ITIL still a valuable framework for those in ITSM? ITIL is the world’s most widely used ITSM framework, and this is unlikely to change with the release of ITIL 4. It is used by a variety of top-tier organizations all over the world, including NASA, Microsoft, Shell and even Disney, with every industry and sector being able to benefit from its best-practices. The widespread use of the framework has made ITIL-certified practitioners highly valuable. Companies utilize their skills, experience and perspective not only to aid in developing new services but also to maximize the value of day-to-day IT operations. Crucially, the framework manages to keep these organizations flexible enough to embrace ‘continuous improvement’ and take advantage of new opportunities for change whenever they appear. That being said, ITIL certifications are not shortcuts to high-paying ITSM roles. Top-level managers will still be expected to have a certain amount of experience which demonstrates their ability to apply ITIL in practice. At the same time, an ITIL certification can definitely go a long way in validating the abilities of an IT project manager. It can also open up a variety of opportunities to work in organizations which utilize the framework: a fantastic way to gain the experience necessary to move on to higher-paying management roles! Good e-Learning has long been one of the best online training providers for ITIL. We were one of the very first to offer an ITIL 4 Foundation course (which has been fully accredited by PeopleCert of behalf of AXELOS), and with a portfolio that covers the entire spectrum of ITIL V3, we can provide whatever training you need to take your ITSM talents to the next level. Unlike the competition, Good e-Learning goes beyond simply providing students with slides and documents. Each of our courses contains a variety of engaging learning tools, such as interactive videos, audio-narratives, motion graphics and even gamified quizzes. Students can also enjoy support from our in-house team of experts, with tutors generally responding within 24 hours to any course queries. We understand the difficulties of juggling training with full-time work. This is why we make sure that each of our courses is fully accessible even on mobile devices and tablets, making it easy for students to return to training whenever they have the time. Students can even enjoy FREE exam vouchers for when they are ready to take their certification exams.